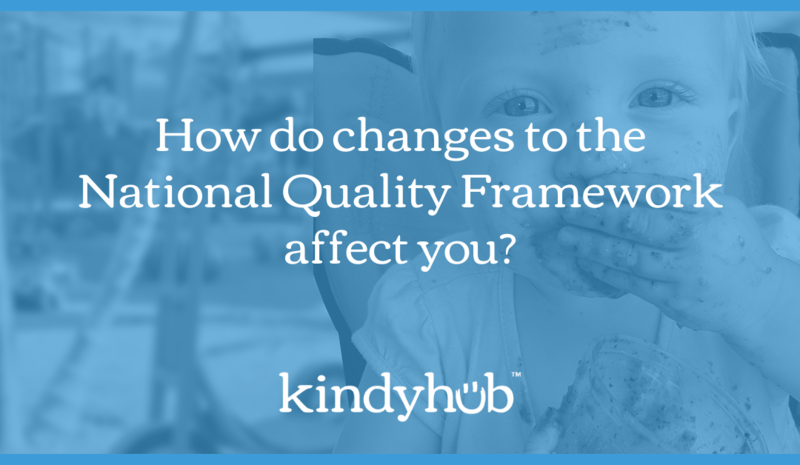 How do changes to the National Quality Framework affect you? There was recently some changes to the National Quality Framework. Once you unravel the official language announcing these changes, you’ll find some very good decision-making. There’s a focus on simplifying things and we like that because it mirrors the Kindyhub™ purpose. Why has the National Quality Framework been updated? Australian, state and territory Education Ministers agreed to changes to the National Quality Framework following a review of the national system for children’s education and care services. The review included consultation with operators about the proposed options, which makes sense to us and no doubt contributed to the positive outcomes. We’re already a couple of weeks in so you might like to check out the key changes below. The revised National Quality Standard and some further revisions will apply from February 2018, with all changes commencing in Western Australia in October 2018. We’ll keep you posted. The number of elements and standards was reduced, removing overlap and making the framework less complex. Language was clarified. So it should be easier and simpler to use. Service and support has been improved in order to achieve better compliance and quality across the whole sector. Good to hear. Service providers have the autonomy to choose responsible supervisors now Supervisor Certificate requirements have been removed (along with the red tape). If you provide education and care to school age children, the new national child ratio of 1:15 applies (with a transitional period in NSW of 12 months). Underneath everything we do, and the intention of programs like the EYLF, is a desire to help educators and service providers to operate more efficiently and know that they are meeting standards of care. Having a framework contributes to the growth and development of children in our care. Kindyhub lets you take families on that day-to-day journey and keep them informed. Let them know that the framework exists and is being met. As far as an Early Years Learning Framework app goes, we’re already making it possible for early childhood centres to meet and exceed the National Quality Framework. – Kindyhub’s Capture feature can be used to tag the EYLF or the centre’s own tailored framework. You’re already meeting the standard in this way, at the same time making a secure record that can be shared and called up later at the touch of a button. It’s a simple solution to what could be a complex problem to keeping parents informed and qualifying the centre’s operations come time for assessment. For information on how Kindyhub™ assists educators to document, share and engage families, please contact us or call 02 8916 7421. You can also get started with a 4-week free trial now.